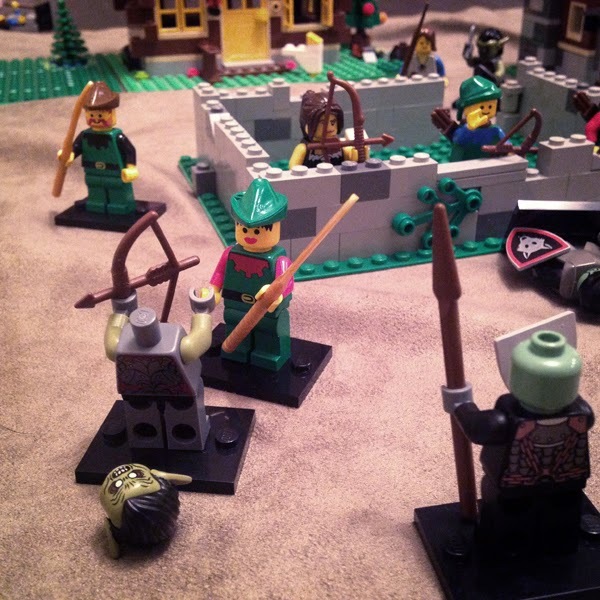 Last evening my12-yr-old and I played Song of Blades and Heroes using our Lego collection. She likes Legos and Lord of the Rings, so it was a fun first game for her. In case you're not familiar, Song of Blades and Heroes is a tabletop fantasy wargame that needs only a handful of models to play. Typically players use painted fantasy models, but Legos work really well. I had a lot of 1980s Lego Castle sets when I was a kid, which my parents returned to me when they moved. So, I have a good number of old Medieval/fantasy pieces to use, and I've been adding newer-made models. 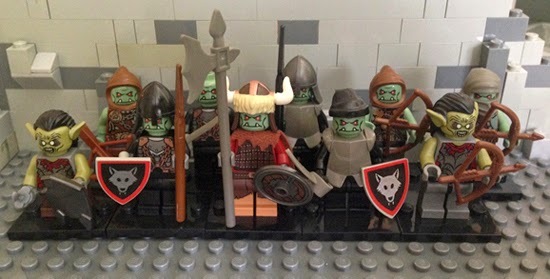 The Lego Fantasy Era sets are out of production (and super expensive on eBay), but I found some of the green troll heads to plop onto my old knights. We played a game of orcs (me) vs elves (my daughter). 4 Orc Warriors, 4 Orc Archers, 1 Orc Warchief, and 1 Goblin Warrior. The elves were defending a village as my orcs attacked. My kid initially complained that there were more orcs than elves. But I explained that her elves were each way stronger and more skilled than my orcs. It was an elvish victory, due mostly to several morale checks that my orcs failed (the Warchief was killed early on). I liked how my kid added narration: instead of simply hopping over the wall she explained, "My elf did a flip into the air and attacked." So I'm very pleased with how well Legos work for skirmish games like this. We'll definitely do this again. Creating terrain was a snap, and it was easy to equip the minifigures to create the characters we needed. If you're playing with kids they will already be familiar with Legos. As opposed to typical plastic or metal miniatures, you don't need to spend time painting. For the game's scale I treated distances as if these were 25/28mm figures. For measuring distance I used lengths of the flat Lego pieces. Mixing and matching minifigure pieces was especially satisfying. For instance, I used the hun warrior body and helmet from the series 12 Lego minfigures set and added grey hands and a troll head. 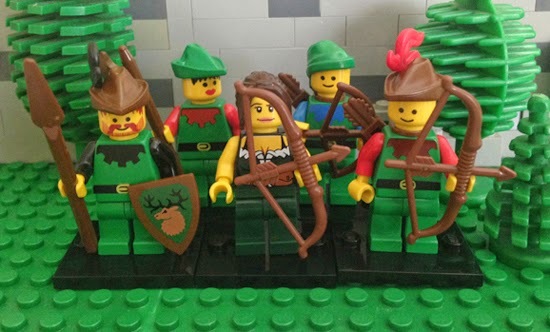 I randomly got the hun at Target, but you can choose specific minifigures from sellers on eBay. I'm excited to see that the upcoming series 13 Lego minfigures includes a goblin, which I will totally buy a dozen of. The head from the alien trooper will make a great D&D mindflayer, and who wouldn't want a female cyclops. Thats a very cool idea!